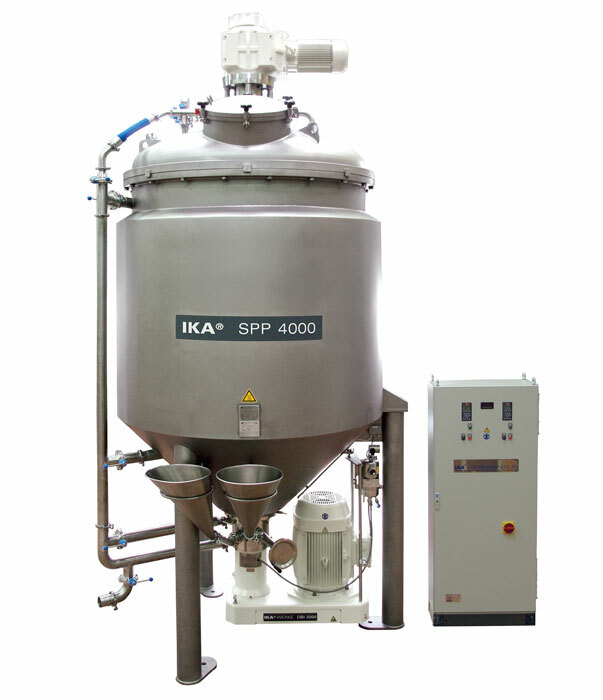 The approved “Standard Production Plant” (SPP) is the IKA solution for the production of emulsions and suspensions in many areas of application. Depending on its execution, the Standard Production Plant can be used for cosmetic creams and lotions, for mayonnaise or dressings in the food industry as well as for suspensions and emulsions in the chemical industry or for production of paints and lacquers. This vacuum kettle design is a well suited alternative to Dual Shaft Mixers and Triple Shaft Mixers. 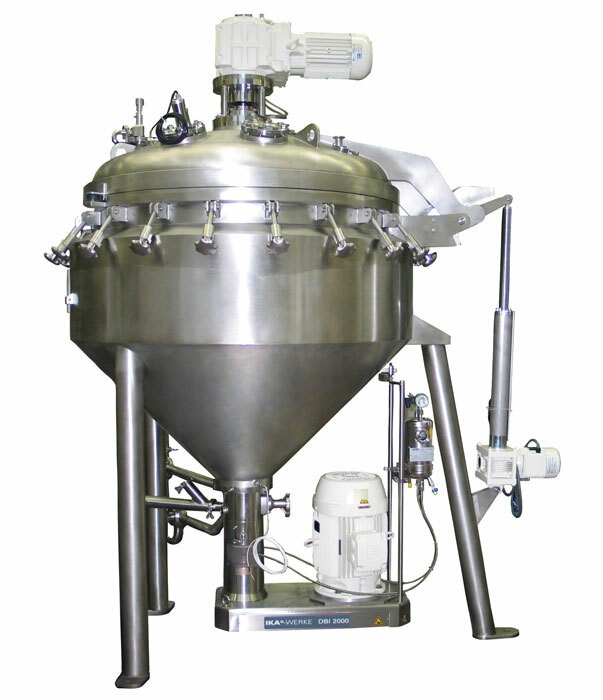 The SPP is an innovative and highly advanced, but cost effective mixing plant used for all standard process operations like mixing, stirring, homogenizing and dispersing. Due to its simple design, it allows easy operation and guarantees a constant mixing quality. Options like vacuum de-gassing, double jacket for heating or cooling and ports for the additive incorporation and sampling makes the SPP an ideal machine for the complete product manufacturing sequence. Due to its unique vessel geometry and integrated tilting mechanism, the SPP has the advantage of unlimited access to the internals and very low installation height. Concentration on the major process requirements enables easy access for all maintenance work or visual checks with a minimum space requirement. The first stage has a pecially designed pump rotor with high circulation performance that creates turbulence in the vessel for the blending and mixing purposes as well as sufficient pressure and throughput for CIP cleaning of the system. The second stage is equipped with a high shear rotor-stator system that ensures dispersions with narrow particle size distribution and consequently long-term stability. The design of the DBI and its outstanding flow rate creates a local vacuum in the dispersing chamber, which results in reliable inline feeding of the product components to the batch volume directly at the dispersing stage. Depending on the process requirements, an integrated valve allows the product either to be pumped without shear through the first stage only or to be processed and dispersed in the second stage. The patented two-stage design allows the DBI 2000 to be mounted onto the SPP in such a manner that the product is transferred through either one or both of its stages. Due to the negative pressure produced by the DBI 2000, between the first and second stage, powders or liquids are incorporated (via separate addition ports) directly into the dispersing stage without the aid of a vacuum pump. This method of addition insures immediate dispersion of difficult to wet powder, greatly reducing the formation of agglomerations. Flow paths on the re-circulation loop provide the means to vary batch volumes and discharge from the pump stage or dispersing stage. As an alternative high shear dispersing can be achieved by incorporating the economic ULTRA-TURRAX UTL 1000 series single stage homogenizer in the circulation line. 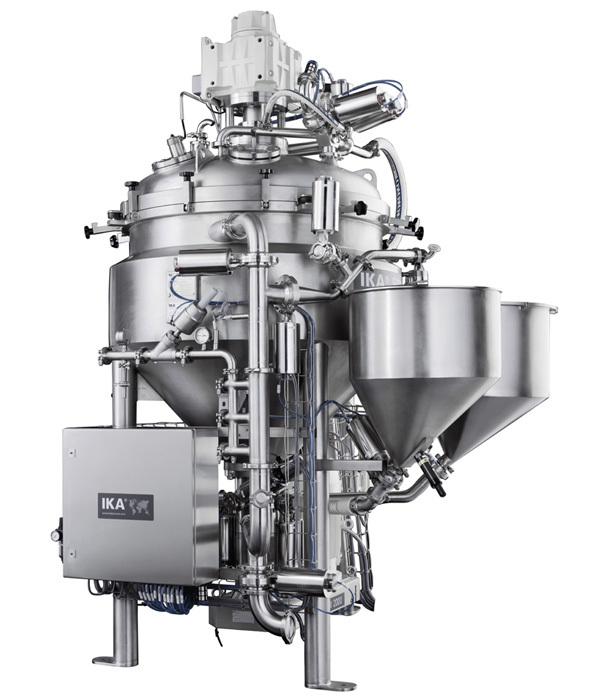 For more complex applications, and especially for additions directly at the dispersing stage, the highly-sophisticated multi-functional two-stage mixing and dispersing machine type DBI 2000 should be selected. 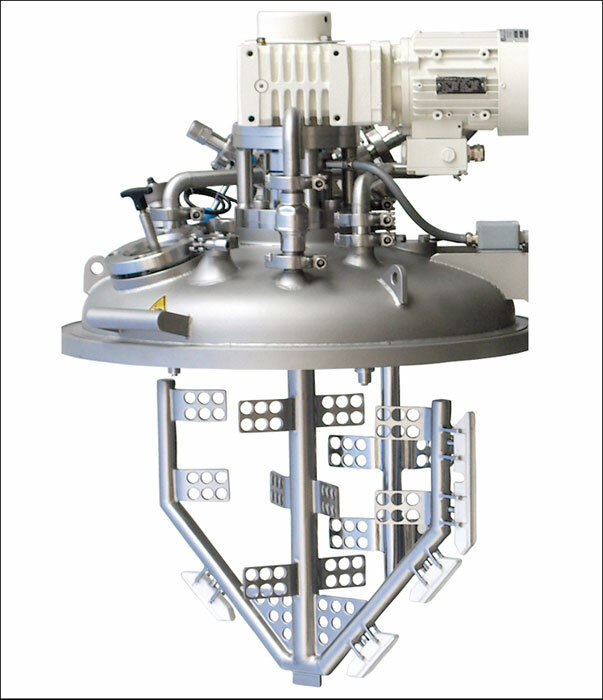 The DBI 2000 is directly mounted to the bottom outlet of the vessel. The Standard Production Plant SPP series comes in 8 sizes ranging from 25 to 4,000 liters production volume.